There was nothing wrong with this and didn't really take up much time, it wasn't ideal in wet or dirty conditions, but ropes get wet and dirty all the time. You had to be careful not to drop too much around it and inevitably brash would tangle up in it or a careless groundy would drag it across the garden! 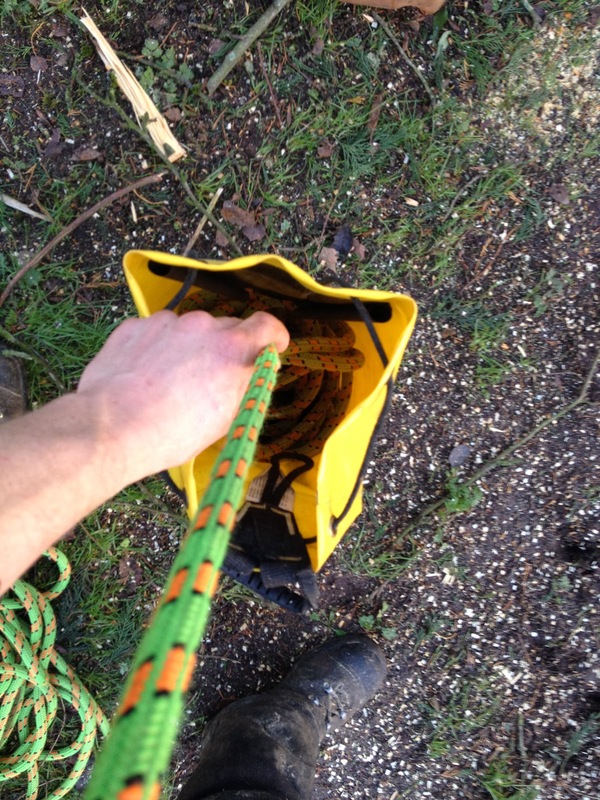 I'd seen other climbers using rope bags and had often thought of trying one out, but to be honest if someone hadn't of given me this one I may not of ever bothered. I have to say I'm glad I did, the bag still fits in my large duffle bag, but now I just dump it at the base of the tree, clip into my harness and climb away. 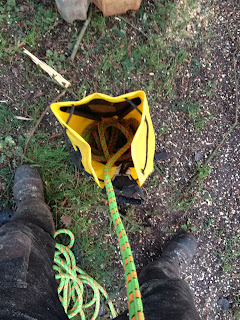 No uncoiling or making sure its not tangled, no more trying to find a dry spot or branches getting caught...well to start with anyway, as you might expect in the course of working the tree it inevitably comes out of the bag and gets in the way again! But on straight forward conifers and small trees it definitely keeps things tidier. I've been using this one for about 18 months/2 years now, its made to the expected high standards of most petzl gear and it is definitely what I would call 'Bomb proof' it frequently has lumps of wood falling on it and piles of brash dragged over it and looks none the worse for wear. Made from TPU its tough and water resistant, most of the seems are welded and show no signs of failing. The stitching on the handle/straps seem solid and I fully expect to get many more years of use out of it. With two webbing shoulder straps its easy to carry over long distances, being unpadded you wouldn't want to carry too much weight but for the average tree climber they are more than adequate. 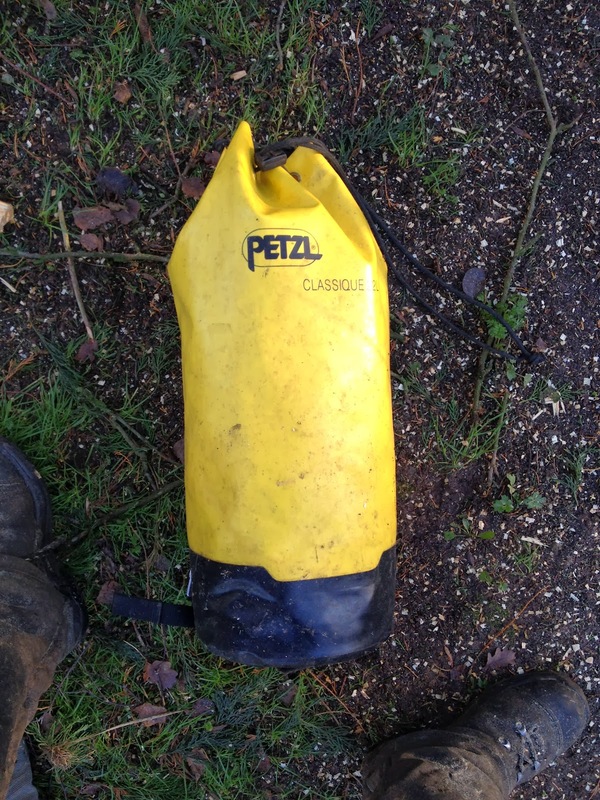 It also has a carry loop on the top with a moulded handle, handy for short distances. The bag also features a cord loop inside for tying the end of your rope too, making it easier to find, if like me you coil the rope directly into the bag. There is also an internal waterproof flap with a clear window for a label, presumably this is for further protection of the contents but to be honest I never use it and it really serves no purpose. The bag is 22lts in volume and happily holds my 40m 11.7mm rope and 3m strop with some space to spare. 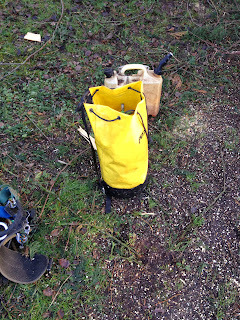 With some rope in the base it will stand up on its own, but obviously not as well as the Bucket bags. 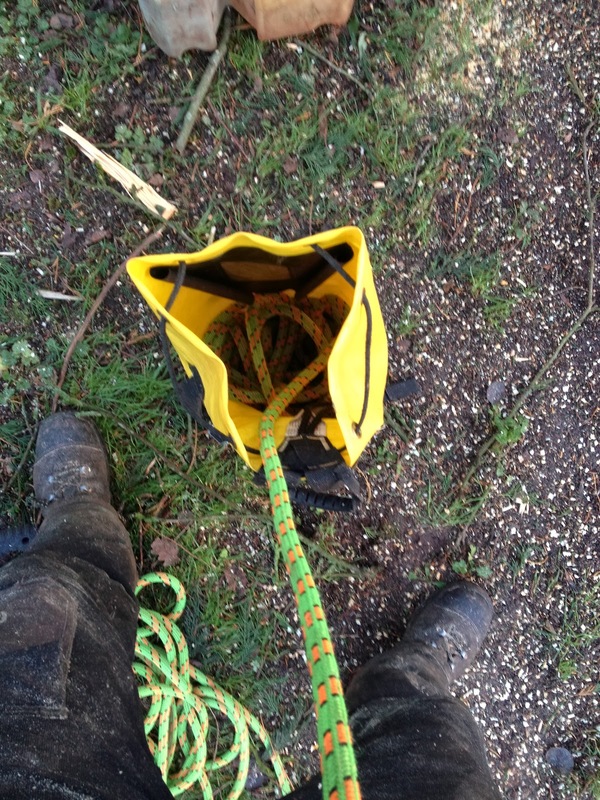 When coiling the rope into it from over your shoulder you sometimes need to lean the bag against your leg to start with and as the opening is not especially stiff it isn't quit big enough when the bag is empty and nothing is keeping it open. But you soon get the hang of it and feeding the rope into the bag takes only a few minutes and ensures that it comes out tangle free when you need it too. The draw string closer is strong and simple, basically there to stop the bag filling with sawdust and the rope from falling out in transit. Overall I'm very happy with the bag, its solid, well made and if it ever wears out I'd definitely buy another. It is slightly overpriced at around the £60 mark, but if it lasts as long as I think it will then definitely a worth while investment. I'd sooner have one thing last me ten years than have to buy one a year! And as for coiling vs using a rope bag, I'm definitely a convert, the only thing you have to remember is that a wet rope doesn't dry in a water resistant bag, they just go mouldy!